Are you interested in turning job interviews into job offers? 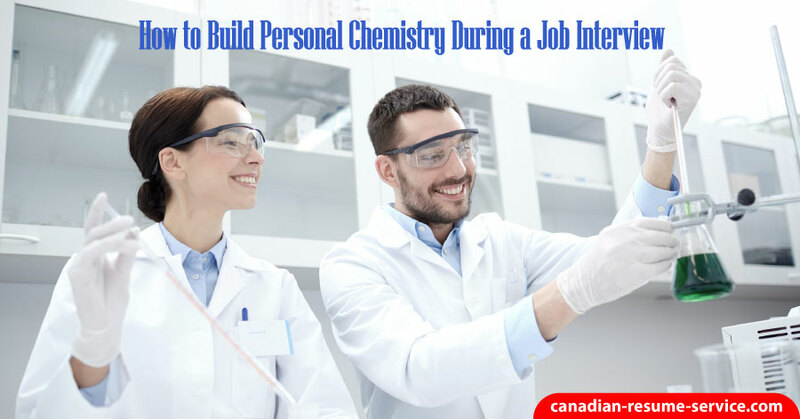 Let me share with you some tips on how to build personal chemistry during a job interview. First of all, no two job interviews are the same, so you can’t plan exactly how the discussion will go, but it’s necessary to have a strategy. It is imperative that you face the conversation as a selling meeting; meaning building personal chemistry and establishing an open dialogue for free information exchange. Success is not necessarily what you say, but how you say it. If you do your homework before the interview you have a substantial advantage over the others; many candidates will fail to do this. Think about it this way, aren’t you impressed when someone is interested in you and knows some of the highlights in your career? You will find a phone conversation arranges most job interviews, so start to build chemistry right there. Ensure your tone reflects that you are confident, enthusiastic, and friendly; be sure to begin to gather any information you can. Try to get a job description, organizational structure, company literature, ask and see what happens. Stir up a short conversation by asking a couple of relevant questions about the position; this shows interest. Don’t kid yourself, this person’s opinion is crucial and does influence the hiring decision. I have a lot of first-hand experience with this—when I was interviewing candidates, the secretary/receptionist would always let me know if the interviewer was rude, non-attentive, enthusiastic, etc. If you go out of your way to be polite, kind, or friendly, the receptionist will more than likely go out of their way to be helpful to you—but don’t overdo it. The moral of the story is, pay attention to the receptionist, they are essential. Try to find out more information about the company or the interviewer that will help you during the interview. Did you know that many interviewers make their mind up in the first few minutes as to whether they want to continue with the job interview? It’s true; so in those few minutes, you need to establish good chemistry, you should have showcased the necessary credentials by having a superb resume. Show a positive attitude, excellent communication skills, confidence, mannerisms, enthusiasm, interest, and cheerful outlook. A smile and a firm handshake are a given. Use real comments, don’t sound phony. One hint for finding something to say is to research the company and uncover areas to share positive comments. Identify an opportunity near the beginning of the meeting to let the interviewer know you heard of such-and-such, or that the company is a contributor to the United Way or another charity. You can also compliment the building, offices, people, products, services, etc., but try your best to be unique and provide some details, if appropriate. Have you ever heard the saying, “it’s not what you say, it’s how you say it”? When answering questions try to use good action-oriented stories. People remember good stories, ones that use lots of action words—it keeps them interested. “Wow, Joe, you look very impressive on paper, you should be able to solve all our problems, so, why should I hire you?” If you try to answer that question, you may run the risk of sounding like you can solve all the company problems when in reality it would be next to impossible. A few interviewers will let their needs be known; this makes it easy for you. You need to put your ‘listening ears’ on and use the information you gain to your advantage. If they don’t give you the information, you may have to pry it out of them by asking job-related questions. If the interviewer isn’t that keen on your qualifications, this type of question may increase your chances of getting a job offer. Listen very carefully and ask the right questions during the conversation, you’ll understand how the interviewer views the problem, their expectations, and how you would fit into the solution they need to reach company goals. Make sure you know your strengths beforehand and be prepared to discuss examples to provide evidence you have those strengths. Use engaging, action-packed real success stories to build credibility. You can then easily relate your strengths to the company needs. Then send a follow-up/thank you letter to everyone that interviewed you. It is polite, expected, and will keep you in the limelight. You will be one step ahead of your competition. Now you have a strategy for building chemistry. Give me a call and make an appointment if you would like to learn more about strengthening your interview techniques and confidence Many clients who have gone through this process state it’s worth every penny.